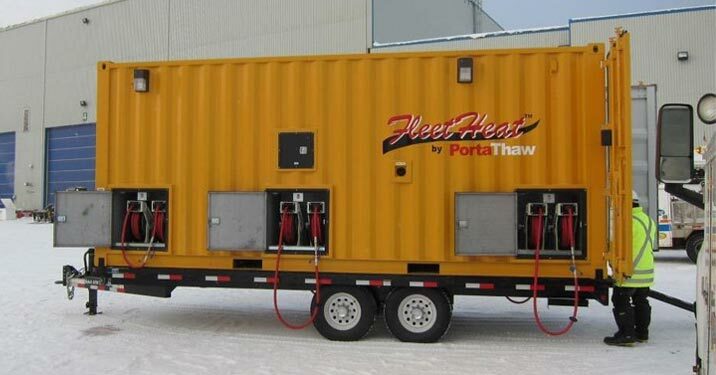 FleetHeat™ is a centralized heating module capable of providing maintenance heat to multiple machines overnight, between shifts, or during shut-downs to keep the equipment consistently warm whilst the machines are not running. FleetHeat™ connects up to any type of mine vehicle using the Thermex quick couple system. This is the ultimate solution to help overcome the ancient practice of overnight idling. FleetHeat™ is powered with an on-board gen-set which also supplies area lighting and power for FleetHeat™’s control system. Each hose reel station has its own circulation gear pump with on / off selector switches. These stations are individually isolated from the primary heating loop. The primary heating loop is completely separate from one another which eliminates any possibility of cross contamination from machines sharing a common coolant header. The unit is equipped with a diesel fuel tank with an external filler neck and illuminated gauge for convenient refills. This is an example of how the FleetHeat™ is designed to operate. 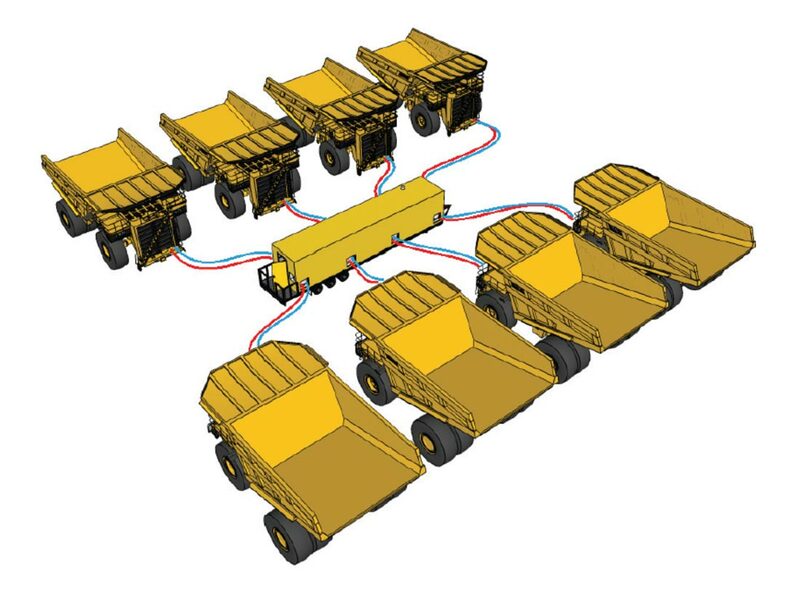 Each Haul Truck connects individually to a dedicated pumping station that provides maintenance heat during cold winter weather. The red lines represent hot coolant coming from the FleetHeat™, and the blue lines are the returning coolant from the engine block back to the FleetHeat™. 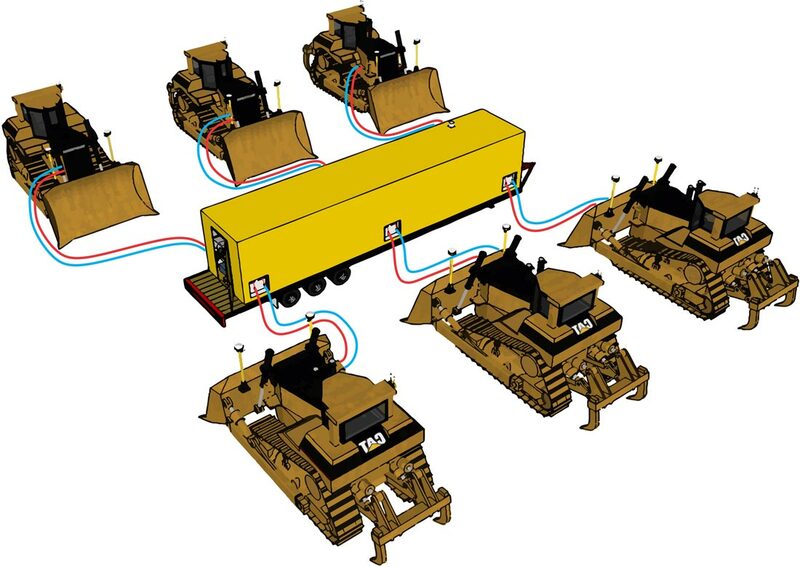 Here is a second example of how the FleetHeat™ system can manage multiple CAT dozers from a single fluid warming station. The coolant lines are kept at maximum efficiency temperature for quick start in frigid climates, and can be quickly uncoupled from the central FleetHeat™ station easily via the Thermex Quick Coupler Manifold system. 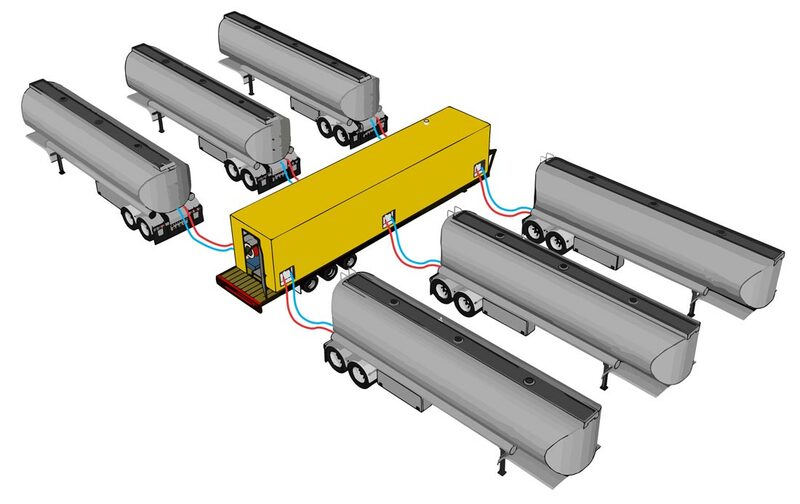 Another application for FleetHeat™ is to keep tanker trailers warm using Thermex HeatProbe™ Fuel Warming Systems. The FleetHeat™ pumps the warm coolant through the HeatProbes™ which are immersion tank heaters installed in the tanker trailer. This way, multiple tankers can be kept warm throughout the night without the worry of product becoming too cold to pump off effectively.